Marie and John Mitchell of Rural Living Today released their new e-book about Livestock Guardian animals last week and told me that I could offer you their brand new book totally free for a limited time only. This book is published through Smashwords and your free copy can be downloaded in several different formats so you can read it on your Kindle, your nook, or even in pdf. The choice is yours. Details on how to get your very own copy of this awesome book follow at the end of this review. 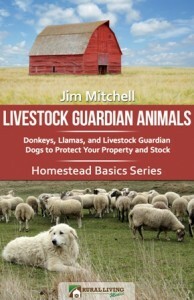 Livestock guardian animals include llamas, donkeys, and several breeds of dogs. At Joybilee Farm, we use both llamas and LDGs to protect our animals and even our children from the bears, cougars, wolves, and coyotes that pass through our 140 acres of forest and wetlands. Then there are the occasional weasels or stouts that decide to take down a chicken — these the dogs chase away or kill outright. And you can tell because the dogs smell like weasel for days. It’s hard to believe that people actually use that scent for perfume – its called “musk”. Give me lavender e.o. instead. We have Pyrenees and Maremma LDGs and really love their natural guarding instinct and gentleness with children. So when Marie, at Rural Living Today, offered to let me review her book and offer you a copy for free, I knew you’d love this, too. Although the book is titled Livestock Guardian Animals, the book only briefly talks about llamas and donkeys in the first chapter. Chapter 1 takes you through a list of questions to help you decide if you need a livestock guardian and if so, what kind of livestock guardian would best suit your situation. The authors have no personal experience with donkeys or llamas and the information provided is biased toward dogs. If you know this when you pick up the book, it won’t bother you. Just plan to research donkeys and llamas outside of this book. This list is quite helpful for newbies who are just starting out and will give you some ideas of the strengths and weaknesses of donkeys, llamas, and dogs. Experienced homesteaders will find the last chapter especially poignant. The second chapter focuses on the different breeds of livestock guardian dogs (LDGs) available and gives you some basic information of how they work on a small farm with good perimeter fencing. One thing they mention several times in the book, is “The Bark.” You don’t want to have LDGs in the city or where there are nuisance dog by-laws. LDGs do bark and it can be really annoying if you don’t understand the reason behind “The Bark”. Definitely read this chapter before you decide to buy a Maremma or other LDG for your flock. In the third chapter, we meet the two Maremmas at Rural Living Today and learn, from the dog’s perspective, what they do with their time, as they guard chickens and pigs. This is a very creative chapter and delightful to read. The pictures of the Maremmas at work really add to the book. The book would benefit with more pictures. The book is short. You can read it in about 30 minutes. It has some good basic information with links to other sites where you can look at pictures of the different breeds of dogs. It would have been nice to see these pictures actually included in the book, with appropriate permission and attribution. While the book talks about Livestock Guardian Animals, it doesn’t spend a whole lot of time on donkeys, and llamas and lumps them together, with similar attributes – I believe that this is a misunderstanding of the natural instinct of these two animals. The authors don’t have experience with llamas so I can understand their misunderstanding. They recommend that a llama be used alone to guard sheep and goats rather than being put in with several llamas into a herd of sheep, goats, or other small animals. I disagree with this advice, as someone experienced with llamas as guardian animals. Male llamas and female llamas have different natural instincts for guarding livestock. Some llamas have no natural instinct to guard other animals at all. But others are especially gifted as guardians. At Joybilee Farm, we selectively breed for guarding instinct and have some great guard instinct in our own llamas. Perhaps we just lucked out. We keep a small flock of llamas and keep them in with our sheep. Since our sheep and goats graze all 140 acres of our farm, the llamas stay with the flock at large and keep everyone safe. The male llama roams the perimeter of the herd and keeps watch on a hill over everyone. He’s been known to help when sheep or goats are giving birth, by standing near the mom and keeping other animals away. The female llamas circle the herd when predators are near and keep them in a tight group, that is easy to move and defend. Females with crias will graze close to the flock and train their babies in their future guardian role. Females without crias will take on the role of drawing predators away from the flock and then turning to fight. This is especially true of stray dogs and coyotes. As the book says, llamas have a natural enmity toward dog-like creatures. One drawback with llamas though is that they retire during their own birthing time for about 3 weeks, and the male then guards his harem rather than the entire flock of sheep, goats, and llamas. We anticipate this and breed our llamas later in the summer so that during the birth of sheep, and goats, when the flock is most vulnerable, they have the llamas’ full attention. The only time of the year that we lose sheep and goats to predators is during this 2 to 3 week window, while the llamas are busy giving birth to their crias. 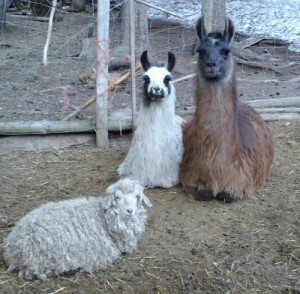 We use our Maremmas/Great Pyr LDGs in tandem with llamas and it works the best for our situation. You really need to look at the whole picture to decide what’s best for your farm. A pair of LDGs without llamas works in a small fenced area. If you free range your flock, however, you may need extra help to keep them safe, if you have a lot of predators in your area. The book is a good addition to the homestead library. There isn’t a lot of information available on LDGs, although shepherds have been utilizing their giftedness for generations. There’s even less available on using donkeys and llamas. While not a perfect book, this contributes a great deal to the discussion and will be a big help to people who are considering a sustainable alternative to predator control on their homestead. You can get your own copy of this brand new e-book for free, by visiting Rural Living Today and subscribing to their email list. You will get a coupon in your email inbox that you can use at Smashwords to get $2.99 off your order there and get Livestock Guardian Animals for free, in the format of your choosing. This is the Monday Menagerie Blog Hop. Link your best posts about animal husbandry, animals on your homestead, LDGs and livestock guardians, and even management challenges on your homestead. Use the link-up links below. And please remember to link back to this post, too, so that your friends can find all the other interesting posts that link up this week.